Jon Rahm captured the Hero World Challenge on Sunday by four shots over Tony Finau, the third worldwide win of the year for the talented 24-year-old. One key to his success? Putting advice from the tournament host, Tiger Woods. The Hero is held at Albany Golf Club in the Bahamas, where the greens are grainy Bermuda grass. In his winner's press conference, Rahm recalled seeking out Woods's help in putting Bermuda greens during the Tour Championship. On Wednesday at East Lake, Rahm said he sidled up to the 14-time major winner to pick his brain. "I said, 'Hey, Tiger, can you please teach me how to putt on Bermuda? You know, I'm not the best, I grew up on poa annua; bentgrass, I'm used to that, but I'm not the best on Bermuda.' "He kind of laughed and told me it's all about feel. I was like okay, whatever, right. And today out there with the trophy, he was like, 'I mean, that's a pretty good performance for somebody who can't putt on Bermuda greens.'" 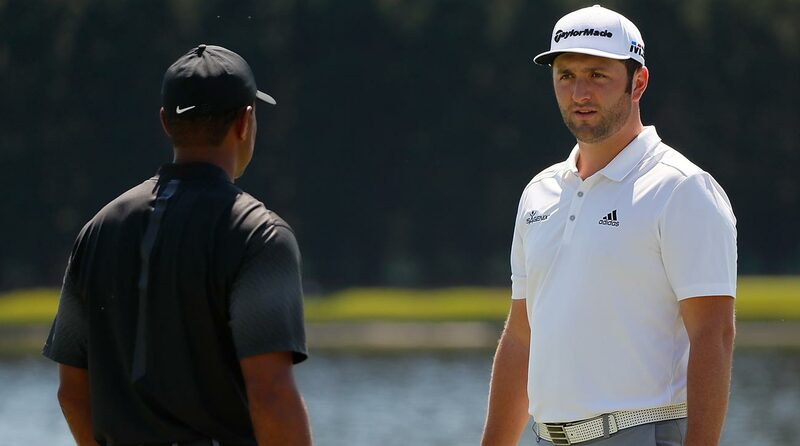 Jon Rahm sought out putting advice from Tiger Woods at the Tour Championship. Rahm, who finished eighth in the field in putting, pointed out that it wasn't entirely his short game that won the week. "I did tell him, my man, you should look at my stats because it was all ball-striking. I really didn't make -- I think I made one putt outside 10 feet, really, and I didn't miss a shot the last three days, it's as simple as that. But I don't think he believed me really." Rahm reflected on just how cool it was to win a tournament hosted by his longtime idol. He described the hours he has spent poring over old videos of Woods's play. "I think I've seen every video on YouTube about Seve [Ballesteros] and Tiger," he said. "Every shot that's ever to be seen on the internet, I've probably seen it. It's because I love the game of golf so much. I enjoy watching all those things, it's just great. If you ever see [Rahm's fiancee] Kelley, ask her because when we started dating I still did that. She had no idea about golf and I would just get the laptop and just make her watch all the highlights of Tiger. I've seen Tiger's final round at Pebble in 2000 about 150 times." When asked which skill of Woods he'd most like to learn, Rahm stuck with the flat stick. "I would say his clutch putting," he said. "It's kind of like the Michael Jordan of golf or the Kobe of golf, right? All the shots they made in the Playoffs, at the end to win events and to win games. Tiger's one of the few who's able to emulate that in golf. All the putts he made coming down the stretch on the last few holes to give himself a chance and to win, hopefully I can get his clutch putting someday."